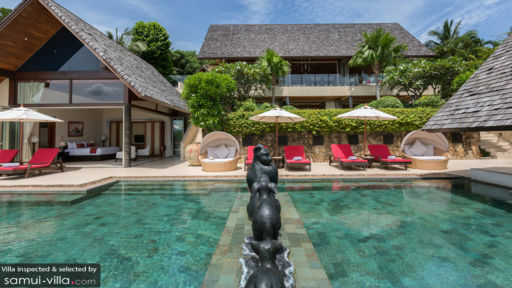 Offering a panoramic view of Samui, Kalya Residence forms part of the luxurious Panacea Retreat in Thailand. You will be surrounded by the peace and tranquillity of the island, with mountainous rainforests and beaches in the vicinity. Kalya Residence is a 4-bedroom haven for those looking for a resort-style vacation away from the hustle and bustle of city life. Retire amidst the breath-taking beauty of Samui and spend a memorable holiday with family and friends. On the pool level of the villa, the master bedroom is situated on one side immediately connecting with the pool. The bedroom has a king bed and a luxurious en-suite bathroom. The room also offers direct access to sun-loungers which guests can utilise for early morning or late night dips in the pool. The other 3 bedrooms are located right next to each other facing the pool. Each room is furnished with a king bed one of which is convertible to twin beds and an en-suite bathroom. 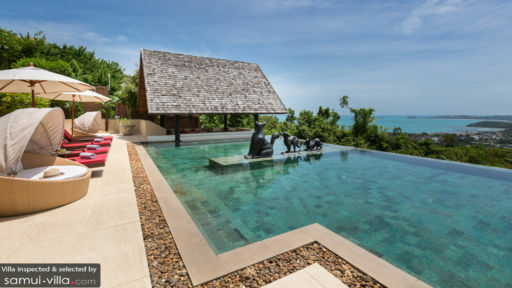 Outside the villa lies a 20m infinity-edge swimming pool that hovers over the island of Samui, offering unhindered beauty for miles ahead. On the side of the pool is an outdoor dining area, or a Sala, with barbecue which you can directly swim to after a dip! Guests can lounge on the sun loungers besides the pool and sip on cocktails prepared by the staff, while working on a holiday tan. 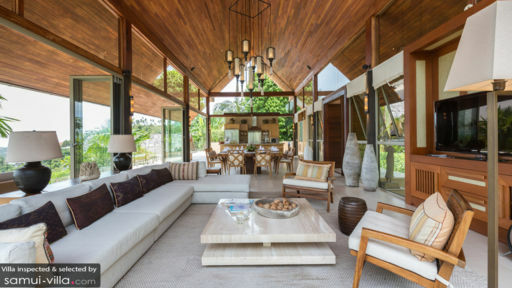 Lined with tropical plants and trees, Kalya Residence will transport you into the wilderness and yet offer you the utmost comfort money can buy! As the sun goes down and the lights turn on, bask in the beauty of Samui as you witness the island’s calming and serene atmosphere from the villa. The open-concept living and dining area has high traditional ceilings, glass panels, and walls which let in a bounteous amount of sunlight during the day and the glass doors keep the place breezy and ventilated. It is situated on the second level of the villa and offers an abundant view of the entire island. On one end of the living area is a fully-equipped sleek, modern kitchen, where you can cook yourselves or have the staff prepare delicious meals for you. The entire space is aesthetically pleasing with pastel tones and woodwork. The square-shaped dining table is comfortable for up to 8 people and is a continuation of the outdoor deck. On the other side, next to an entire glass wall is sitting area with plush sofa sets and chairs where guests can sit and talk with their family and friends while taking in the beautiful scenery all around them. There are full-time staffs serving the guests at Kalya Residence. The friendly and generous staff will make your worthwhile and comfortable. Guests can enjoy a lavish breakfast each morning. You can also make use of daily laundry facilities at extra cost. You can enjoy a variety of activities such as sailing trips, motor boating, fishing, scuba diving, hiking and island exploration while you’re in Kalya Residence. Chaweng beach, the centre of all tourist activity is situated at a short distance and the villa overlooks the Fisherman’s village offering guests with an opportunity to explore the area.